The ALS Association is the only ALS nonprofit organization to support people with ALS on every front — care services, research, and advocacy. Find out how money raised by Walk teams all over the country positively impacts these important mission priorities. Providing the best quality care for people living with ALS is a top priority for The ALS Association. 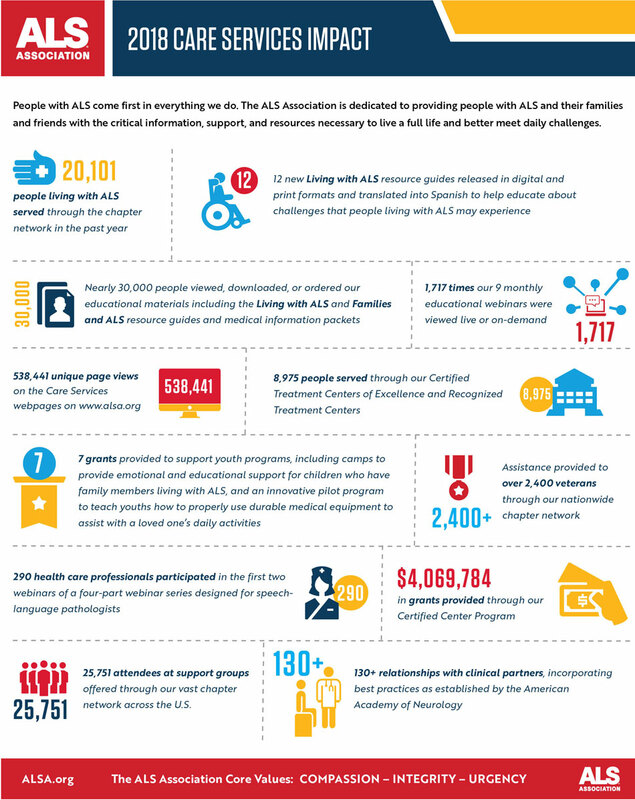 We support people with ALS and their caregivers on every front through a network of 39 chapters and two additional service areas to ensure we can provide support in 50 states across the U.S.
Our care services staff provides accessibility programs, access to transportation, educational seminars, referrals and equipment loans, support groups, referrals to ALS clinics and physicians and more. In collaboration with some of the best ALS physicians and clinics across the U.S., we ensure that people living with ALS have access to specialized care based on standards of care established by the American Academy of Neurology and Research. Learn more about Care Services.